[Important Note]: Early in 2015 Pokerstars decided to cancel all proposed rake changes except for Spin and Go games. I won't speculate as to the reason why here. So basically most of this article is now meaningless. I will leave it up though as there are some important points made about the industry as a whole and the competition from other sites. Perhaps you have heard by now that Pokerstars has recently decided to increase the rake in many of the games that they spread. 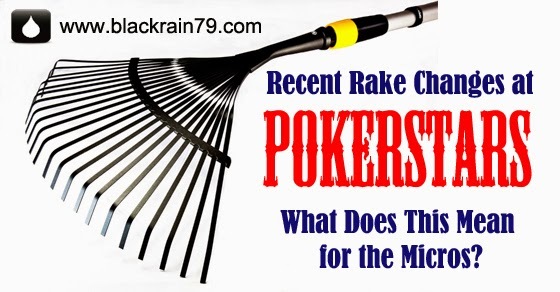 Rake is the small amount that gets taken out of a cash game pot or a tournament entry fee by every online poker room and casino on earth. They use it to pay their bills and to make a profit as well. Poker players tend to get a little bit angry when the rake goes up at their favorite card room. Because frankly, no matter how the poker room tries to spin it, there really is no benefit to them at all. They are basically paying more money to play the same game. This obviously affects their bottom line. So in recent days there has been plenty of rage posting, threats and furious lectures directed towards Pokerstars on several poker forums. As is usual in a situation like this though, many of these people have not taken the time to actually consider the implications of the changes that Pokerstars has made. Nor have they considered what Pokerstars competitors are up to. They simply want to go on their rants and fill these threads with nonsense. 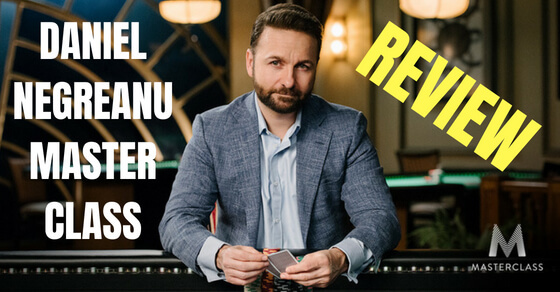 So in this article I am going to clear up the facts with regards to what these changes at Pokerstars actually mean for you as a micro stakes cash game player. 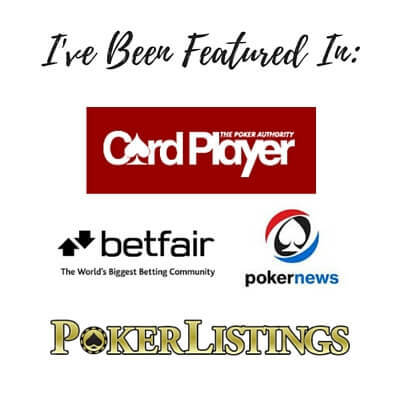 Now I know that there are some people who read this blog who play other formats such as SNGs or MTTs as well as live poker. There are also plenty of Americans who read this blog and unfortunately their government decided to effectively ban them from playing on Pokerstars while on US soil a few years ago. Lastly, maybe you just don't give a crap about the rake at all! For all of these people, this article is probably not for you. 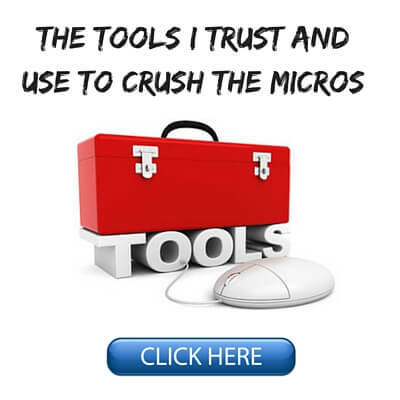 The vast majority of the people who read this blog though are micro stakes cash game players and they take the game fairly seriously (i.e., likely to give a crap about the rake). Also, Pokerstars is still the largest online poker room in the world by a huge margin and so any changes that they make are likely to affect a lot of you. These are the rake changes for NL/PL ring games that "PokerStars Steve" announced a few days ago in the main announcement thread on 2+2. The first thing that you will notice is that there is nothing mentioned for NL2, NL5, NL10 or NL25 at all. These are the stakes where the large majority of people reading this article play at. 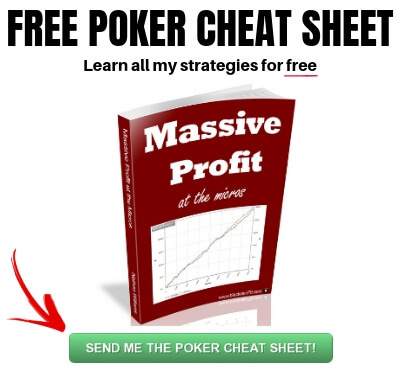 These are also by far the most popular cash game limits on the internet. All changes start at NL50. Therefore, I can only conclude that the complete omission of NL25 and below in the chart above indicates that there are no changes at all for the lowest stakes cash games. Everything that I have read about the rake changes in recent days supports this assessment as well. These stakes are omitted on the chart above because there are absolutely no changes for them. So 90% of you could probably stop reading this article right now. However, please do continue on if you want to know more about which games at higher limits are affected, how Pokerstars compares to it's competitors and a cool rant by me at the end. Well clearly the rake has increased considerably in heads up (HU) games. The rake cap has doubled at stakes ranging from NL50 to NL2000. The rake cap has in fact quadrupled at NL5000 but I doubt anyone who plays at stakes that high reads my micro stakes blog anyways. At least I hope they don't! Anyways, concerning the micros, clearly this doubling of the rake in HU games at NL50 and NL100 is worrying. Some people have even gone so far as to predict that "HU games will be dead." I find this a little bit hard to believe since the edge that you have over a fish in these games is so large. But for all of those who do not practice good game selection in HU, these changes will likely affect their bottom line in a pretty substantial way. I am not a big fan of these rake changes because they will also have an impact on people who start tables. Many of you will know that I have long advocated this as a good method for finding the fish. Table starters are also just good for the games in general. We don't need 18 people on a waiting list when there are plenty of open tables available which could be in action if somebody would just sit down! However, once again these changes should not affect the large majority of you to any considerable degree. The rake cap does not change until NL50 and it is really only going to affect the people who play HU all the time. If the only HU that you play is when starting tables, then you will know that it rarely stays HU very long anyways. And as you can see above there are no changes in the rake for 3 or 4 handed play until NL5000. How About 6max and Full Ring? Ok let's finally get to what most of you actually play which is 6max and full ring micro stakes cash games! Once again by referring to the chart above it is very clear that there will be absolutely no changes at all to the rake cap on micro stakes and even mid stakes 6max and full ring cash games. The rake cap does not change in these games until NL5000. On a side note, while rake changes do affect all limits, once you get to stakes where you are buying in for $5000 a $2 increase in the rake is pretty unlikely to affect the action to any considerable degree. These games often only run these days when a fish sits or a reg is on tilt anyways. Before I discuss anything else I want to summarize the rake changes at this point for all micro stakes cash game players. 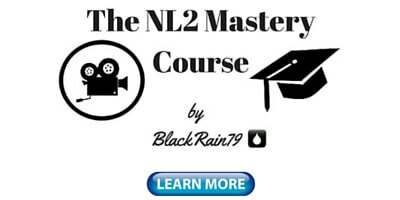 If you play at NL2, NL5, NL10 or NL25 (any format), then absolutely nothing will change for you at all. If you play 6max or Full Ring then nothing will change for you until NL5000. If you primarily play HU at NL50 or higher, then the amount of rake that you pay will go up substantially. If starting tables at NL50 and higher is the only HU that you play, then the rake changes should be relatively minor. How Does Pokerstars Rake Structure Compare to Other Poker Rooms? 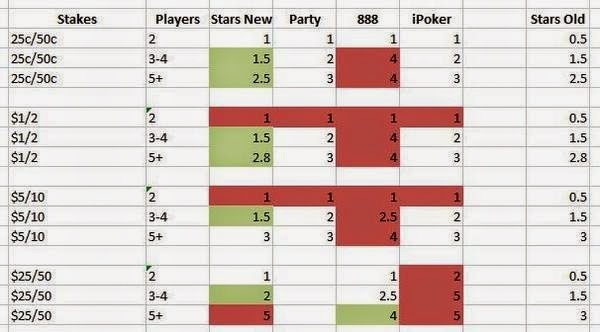 This breakdown of the new Pokerstars rake structure versus their largest competitors was posted the other day on Twitter by poker player Rupert Elder. Now I have not independently verified all of these numbers myself. However, I have seen a similar story in many other comparisons. Also, Pokerstars themselves have claimed that they still have some of the lowest rake levels in the industry even after the changes. The numbers above clearly do indicate that. Oh But the Games at Pokerstars are So Hard! This has been the battle cry of the angry forum commentor in recent days when faced with these numbers. Everybody seems to believe that it is an immutable fact these days that Pokerstars is the hardest place to play poker in the history of the universe. Is this true? I don't know. How would you even begin to quantify that? Yes, Pokerstars and it's rakeback system lead themselves to way more mass multi-tabling nits than most other sites. 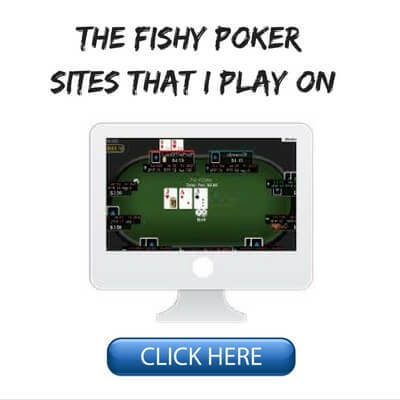 However, with the sheer quantity of action that Pokerstars provides I don't think anybody could argue that they actually have more fish in total than any other site. Perhaps they are on the low side in fish per capita but when you have close to 8 times as many active players as the next most popular card room, obviously there are going to be more bad players overall. This is why I have stressed the importance of table selection so fiercely on this blog and elsewhere in recent years. People who say that there are no fish on Stars anymore are either seriously lazy or blind. 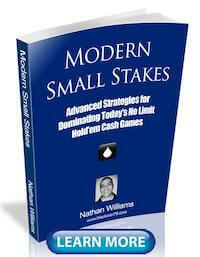 I don't want to get into a big analysis of the Pokerstars rakeback program versus other sites. That is a topic for another post. However, I think the general consensus has long been that for low stakes and low volume players you are worse off at Stars than most other sites. However, high volume and decent stakes players are better off at Stars than elsewhere. I think this is largely still the case today. Pokerstars did recently have an announcement to make regarding changes to their rakeback program for 2015 as well. There is only one change being made and you can read about here. The change only affects Supernova Elite (SNE) players by removing the $5200 tournament entries that they previously received. This is about a 5% cut to their overall rakeback. Keep in mind that only 371 people among Pokerstars millions and millions of player accounts actually achieved SNE last year. And certainly nobody playing micro stakes cash games was among them. Well clearly I am just a Pokerstars shill! Numbers, data, an honest break down of the facts? Where is the irrational anger and outrage? At least call them a few nasty names on the internet! Seriously though, I do expect some backlash because of this post. That's fine, have at me in the comments below or elsewhere. There are very few people that I have seen in recent days who are willing to stand up for common sense for fear of getting roasted by a few self-entitled and delusional poker players out there. I will admit that my tune might be slightly different if the rake changes affected the games that I play in to any considerable degree. I certainly do sympathize with the HU, SNG and MTT players for whom these changes have far wider consequences. However, I also think that the point that so many people are missing here is that Pokerstars (and indeed all of their competitors as well) are businesses. They don't actually owe you, I, or anyone else anything. Many people have called the new ownership group at Pokerstars short sighted, greedy idiots intent on a money grab and ruining the entire industry. No, actually they (Amaya) are a business entity making a business decision which happens every day in a million different industries all over the planet. Look, I am not here to defend or cast blame on the rake changes that Pokerstars has recently decided to make. Nor am I going to offer any opinion on how I think it will affect their long-term business model. God knows we have enough experts on that over at 2+2 already. Me? I am just going to let Amaya run their business as they see fit and leave it at that. The reason why is due to the other point that so many people seem to be missing here. We do not have an ownership stake in Pokerstars. Heck, we are not even employees of Pokerstars. We are actually just customers. However we hold a ton of power for one simple reason. If we don't like what we see with one particular poker room, then we will simply move our action to another one. If all of the poker rooms decide to make their rake too high for instance, then new sites will emerge to take their business. A perfect real world example of this in recent years is the rise of so called "budget airlines" such as Ryan Air, Air Asia and JetBlue. Many of these companies have made a big dent in the airlines industry by simply offering lower fares than the traditional big carriers. Online poker is a multi-billion dollar cash cow, which though it may be in decline right now according to some, is not going away any time soon. Believe me Pokerstars is not some monolith that can get away with whatever they want. After closely watching this industry for 10 years now I can tell you that things can change in a heartbeat. If you believe that Pokerstars has indeed over-stepped their boundaries here, then you can show them who is boss by simply withdrawing your bankroll and choosing not to play there ever again. Put your money where your mouth is. Sitting around complaining about it all day is just silly. When Toyota raises the price of it's cars do you rant about it on the internet and call them a bunch of nasty names? Of course not! You go buy a Honda instead! Should You Continue to Play at Pokerstars? This is really up to you at the end of the day. I can tell you that I personally will continue to play at Pokerstars in the foreseeable future because as noted above, their rake structure is still very competitive (if not the lowest) across the industry at least in cash games. 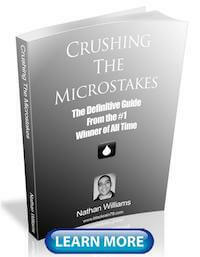 Their software and customer support are also still way above the level of their competitors. And lastly, contrary to popular belief it is my opinion that there are still plenty of fish on Pokerstars if you just take the time to look around (although admittedly it takes much less effort on some other sites). However, I will continue to spread my action around elsewhere when I see better games, rake structures and rakeback opportunites as well. This is something that I would highly encourage you to do as well. Let me know your thoughts on this contentious subject below in the comments even if you hate my guts now. Just keep it relatively civil please :) If you enjoyed this article please "Like" or "Tweet" it below! Still wish I could play there. You made it very clear for me Nathan! Awesome post. The Israeli-Canadian Isai Scheinberg [who would be arrested & thrown in jail if he stepped onto U.S. soil] gets his son Mark to "sell" Rational Group to Montreal-based Amaya Gaming Group to placate U.S. regulators. The Amaya Gaming CEO is a 33 year old guy - David Baazov, who was born in Israel and grew up in Canada. Amaya was a nothing company eight years ago & suddenly they ballooned in profitability & business scope. Isai worked for IBM in Canada years ago. David Baazov started his career in computers & consumer electronics. The question that needs to be asked is who has shares in the companies/finance houses/merchant banks who themselves have shares in Amaya? In my opinion Amaya only appears to own Rational Group. The wizard behind the curtain is still Isai. When the PokerStars/Full Tilt brands penetrate the USA market & Russia [Isai was born in Lithuania I think] the share value is going to rocket & Isai/Mark/David will be incredibly wealthy. "The cap for ring game rake for hands dealt at PL/NL games to exactly two players will increase to $2 for stakes $25/$50 and higher and $1 for all other stakes." I think that 2-25NL tables will also be affected by the rake changes. Am I wrong? When he says stakes "$25/$50" and higher he means $5000 buyins. He does not mean 25NL and 50NL. According to the chart that I posted above (which is from Pokerstars Steve) there are no changes at 2NL-25NL for any format. At NL50+ there will be changes for HU play. And as far I understand this does include HU play when starting a new table on a full ring table for instance. thanks for your comments on how tough poker stars (allegedly) is. I think the rule of thumb is that 90% of poker players lose money in the long term. Therefore, it seems to follow that the largest poker site must have the largest number of losing players. As you have (repeatedly) pointed out, game, table & seat selection matter. Yes that would seem to follow and that is definitely my argument. I think that the reason so many people think that Stars is tough is because the fish are harder to spot among the many more grinders, many of whom are also losing players and mass multi-tabling. The fish stick out more at small sites where there are only 5 tables running for your limit.